Anatoliy Stepanovych Hrytsenko (Ukrainian: Анатолій Степанович Гриценко; born 25 October 1957) is a Ukrainian politician, independent[nb 1] member of the current Ukrainian parliament, former Minister of Defence, member of the Our Ukraine political party and leader of the Civil Position party. Hrytsenko graduated with honours from Kyiv Higher Military Aviation Engineering School on 23 June 1979. On 10 December 1984 he was awarded a Candidate of Sciences (Ph.D.) degree from Kyiv Higher Military Aviation Engineering School. And in 1993 Hrytsenko graduated from the Defense Language Institute of the United States Department of Defense. 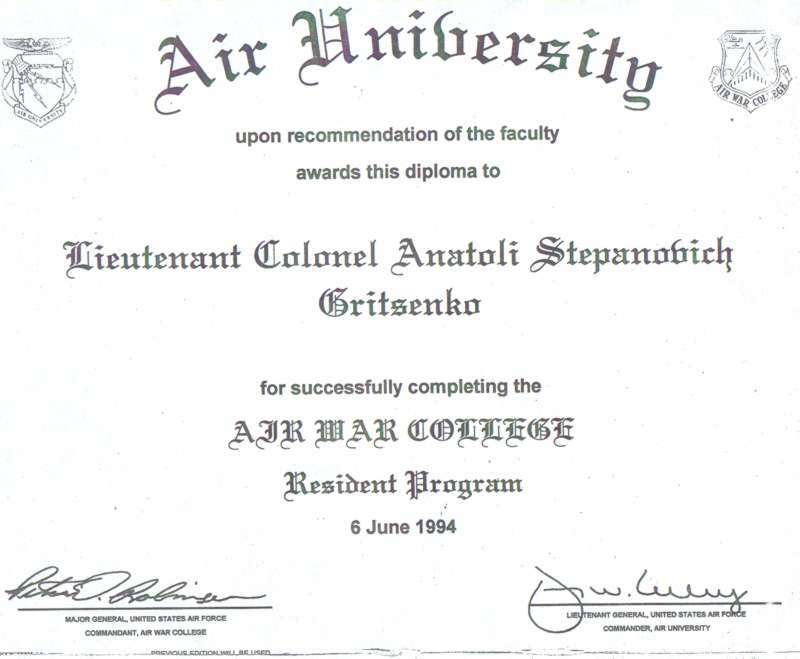 On 6 June 1994 he graduated from the Resident Program of the U.S. Air War College And on 30 October 1995 Hrytsenko graduated from the Academy of the Armed Forces of Ukraine. Hrytsenko is author of more than 100 scientific papers published in Ukraine, Belgium, the Netherlands, United States, Germany and Switzerland. Hrytsenko served 25 years in the Armed Forces of Ukraine, in combat units, as teacher at the military college and in staff positions in the Ministry of Defense of Ukraine. From December 1999 till 2004 he worked as a military consultant in various firms. In February 2000 Hrytsenko served as Freelance Consultant on the Committee on National Security and Defence of the Verkhovna Rada (Ukraine's parliament) and in November 2000 as a member of the Public Council of Experts on domestic issues of the President of Ukraine. In 2004 Hrytsenko worked in the election headquarters (for the 2004 Ukrainian presidential election) of Viktor Yushchenko and took an active part in the writing his election program. Hrytsenko became Minister of Defence in the First Tymoshenko Government in February 2005, he continued this position in the Yekhanurov Government. On 4 August 2006 he was appointed again as head of the Ministry of Defence in the government of Viktor Yanukovych on the quota of President Yushchenko. In the early 2007 parliamentary elections he was elected into the Verkhovna Rada (Ukraine's parliament) as number 4 on the party list of the pro-president Yushchenko Our Ukraine–People's Self-Defense Bloc. Although this bloc was part of the Second Tymoshenko Government Yuriy Yekhanurov became Minister of Defense in this cabinet. In January 2010 Hrytsenko became party leader of Civil Position. Hrytsenko was a candidate for President of Ukraine in the 2010 Ukrainian presidential elections, during the election he received 1,2% of the votes (finishing ninth). In the second round he called on voting against both candidates (Yulia Tymoshenko and Viktor Yanukovych). Civil Position gained one seat in the Ternopil city council during the 2010 Ukrainian local elections. During the 2012 Ukrainian parliamentary election Hrytsenko was elected into the Verkhovna Rada as 3rd on the electoral list of Batkivshchyna., but he later resigned from Rada because of disagreements with the faction. Hrytsenko was one of the candidates for presidency in the 2014 Ukrainian presidential election. According to the opinion poll ordered by 1+1 TV channel and conducted by GfK Ukraine on 6–8 May, 5.6 per cent of the surveyed would cast their votes for him. In the election he received 5.48% of the vote, ranking him in 4th place. Hrytsenko's Civil Position nominated Hrytsenko as a candidate in the 2019 Ukrainian presidential election on 11 January 2019. Hrytsenko's candidacy is supported by the European Party of Ukraine, Native Land, Alternative, and Wave. On 1 March (2019) fellow candidates Andriy Sadovyi and Dmytro Gnap withdrew from the election and urged (their) voters to support Hrytsenko. On 7 March Dmytro Dobrodomov stepped out of the election also in favor of Hrytsenko. During the 2019 presidential election campaign Hrytsenko proposed to create a Ukrainian military reserve force and to to legalize firearms (including registration of all firearms). According to the declaration, in 2016, Hrytsenko earned UAH 150 thousand. He has four apartments in Kiev (with an area of 56.2 m², 80.2 m², 32.9 m² and 110.3 m²), a car Volvo XC90, as well as 106,000 euros in bank accounts. From 1978 to 2002, he was married to Lyudmila. The couple had two children. Olexiy (born 1979) graduated from the Kiev Polytechnic Institute, he was a forward and then vice president of the Berkut Hockey Club, director of business development at the Enran Telecom research and production company, and first deputy head of the Youth Union of Our Ukraine party. In 2006, Enran Telecom (in which Olexiy Hrytsenko was working at the moment) became one of the co-executives of the project to create a unified automated system for managing of administrative and business processes in the Armed Forces of Ukraine. About a UAH 100 million was allocated for the implementation of the project. The eldest daughter Svetlana (born 1982) graduated from school with a gold medal, received a bachelor's degree in international economics from the Kyiv National Economic University and a master's degree in international business from University of Stirling in Scotland. Svetlana worked as an expert at the Ukrainian Centre for Economic and Political Studies (UCEPS) and in the election headquarters of Viktor Yushchenko, then became the press secretary of the Berkut Hockey Club and the project manager for the Kiev office of The PBN Company. Anatoliy Hrytsenko is married to Yulia Volodymyrivna Mostova, a chief editor of well known Ukrainian newspaper Dzerkalo Tyzhnia and a widow of Oleksandr Razumkov. Hrytsenko and Mostova had to celebrate the wedding seven times, most recently in June 2003, together with the then-future Ukrainian President Viktor Yushchenko and his wife Kateryna Chumachenko. On 6 March 2016, the couple married in the church. Hrytsenko and Mostova have a daughter Anna (born 2004), also Mostova have a son Hlib (born 1999) - the youngest son of Razumkov. ^ In the Ukrainian context, an MP is considered independent if he/she does not belong to any faction represented in the parliament, hence, not necessarily non-partisan. The Ukrainian term is позафракційний which literally means out of a faction. ^ "Order of President on appointment of Anatoliy Hrytsenko on Ukraine Minister of Defence position". 2005-02-04. ^ "Order of President on dismissal of Oleksandr Kuzmuk from Ukraine Minister of Defence position". 2005-02-03. ^ "Diploma of Kyiv Military Aviation School". Archived from the original on 2007-03-21. ^ "PhD from Kyiv Military Aviation School". Archived from the original on 2007-03-21. 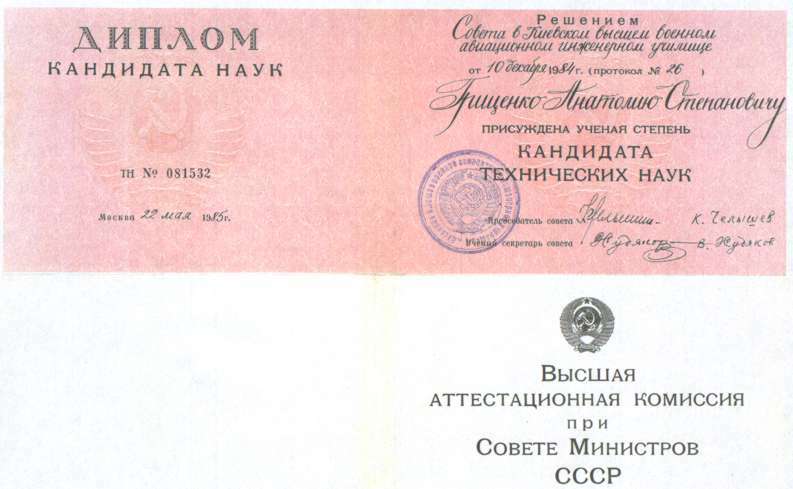 ^ "Diploma of Air University". Archived from the original on 2007-03-21. 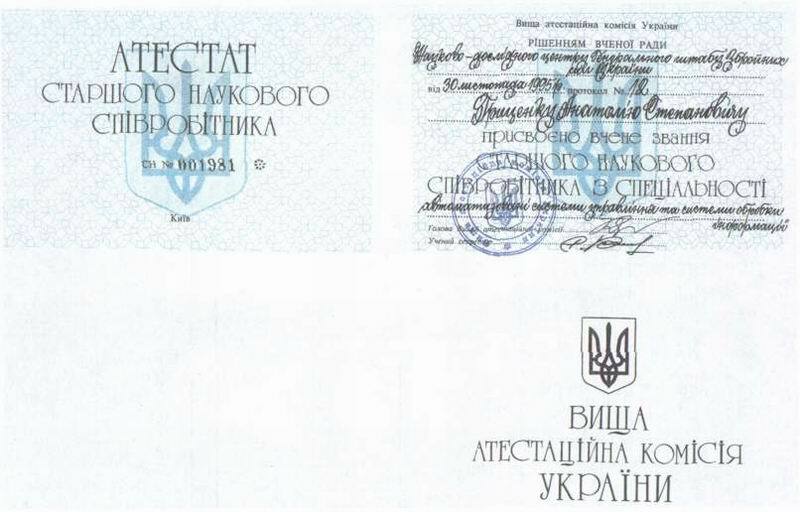 ^ "Diploma of Academy of the Armed Forces of Ukraine". Archived from the original on 2007-03-21. ^ "Hrytsenko joins the fight for the presidency". 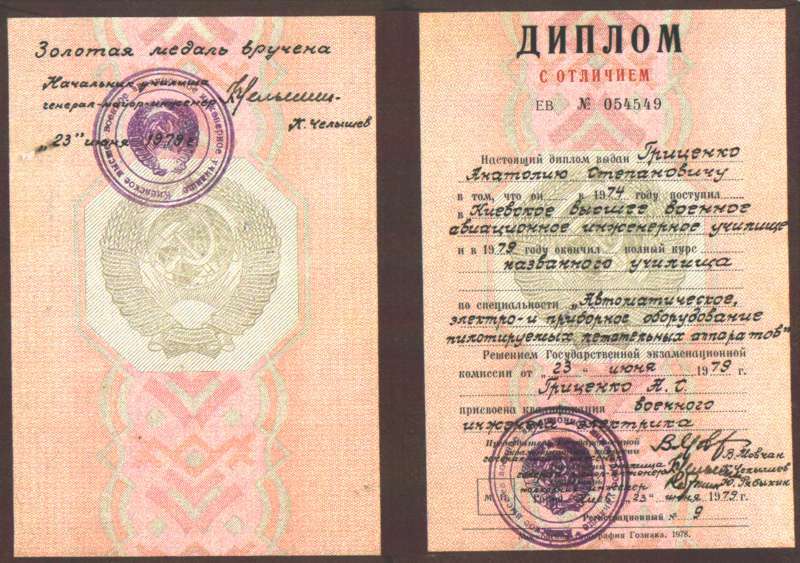 URA-Inform (in Russian). May 28, 2009. Archived from the original on July 17, 2011. Retrieved 2009-06-15. ^ "Порошенко тотально лідирує в електоральних симпатіях українців, Тігіпко трохи випереджає Тимошенко - опитування GFK" (in Ukrainian). Finance.ua. 12 May 2014. Retrieved 16 May 2014. ^ "Poroshenko wins presidential election with 54.7% of vote - CEC". Radio Ukraine International. 29 May 2014. Archived from the original on 29 May 2014. ^ "Sadovyi withdraws from presidential race in favor of Hrytsenko". www.unian.info. Retrieved 2019-03-01. ^ "Указ Президента України № 1019/2007 від 25 жовтня 2007 року «Про нагородження А. Гриценка відзнакою „Іменна вогнепальна зброя"»" (in Ukrainian). Verkhovna Rada. 25 October 2007. Retrieved 26 November 2018. ^ Igor Yelkov (4 September 2008). "Наган от министра" (in Russian). Rossiyskaya Gazeta. Retrieved 26 November 2018. ^ "Декларація про доходи Анатолія Гриценка за 2016 рік" (in Ukrainian). Anatoliy Hrytsenko's personal site. Retrieved 4 December 2018. ^ Vitalii Rybak (21 May 2018). "Former Defense Minister Hrytsenko Is Finally Having His Moment in the Sun". Atlantic Council. Retrieved 4 December 2018. ^ Valeriya Savchenko, Alla Kotlyar (5 March 2005). "В тылу власти" (in Russian). Dzerkalo Tyzhnia. Retrieved 12 December 2018. ^ a b c d "Министр обороны Анатолий Гриценко: «Была ситуация, когда моей женой увлёкся другой. Этого человека в Украине уже нет»" (in Russian). Fakty i Kommentarii. 10 February 2006. Retrieved 12 December 2018. ^ "Гриценко Алексей Анатольевич" (in Russian). Amateur Hockey League. 25 February 2018. Retrieved 12 December 2018. ^ "Кто мешает работе Антикоррупционного бюро?" (in Russian). KP. 25 January 2017. Retrieved 12 December 2018. ^ "Министр без диплома" (in Russian). From-UA. 19 October 2012. Retrieved 12 December 2018. ^ "Мостовая Юлия Владимировна" (in Russian). Livyy bereh. 4 May 2018. Retrieved 14 December 2018. ^ "Анатолий Гриценко: Политик с пламенным сердцем" (in Russian). tv.ua. 7 May 2014. Retrieved 14 December 2018. ^ "Анатолий Гриценко обвенчался с Юлией Мостовой через 13 лет в браке" (in Russian). gazeta.ua. 10 March 2016. Retrieved 14 December 2018. Wikimedia Commons has media related to Anatoliy Stepanovych Hrytsenko.